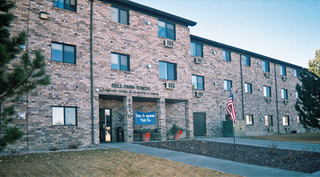 Bell Park Tower is a 40 unit, three-story, HUD 202 PRAC subsidized complex for individuals or their spouse at least 62 years of age that meet income requirements. The one-bedroom, unfurnished apartments are cozy and comfortable with complete kitchens. Each apartment has its own thermostat controlled furnace and air conditioner. A laundry room, on the first floor, is available to residence at no charge. An elevator is located in the center of the building to assist residents with movement throughout the complex. A community room hosts a number of recreational and leisure programs for the residents who reside at Bell Park Tower. The community room is also a great place for the residents to sit and visit throughout the day. Local residents may also schedule the community room for social gatherings. Bell Park Tower has a Community Administrator who lives on-site and oversees the administration, maintenance and repair of the building and grounds. Our partnership with the Senior Center, allows residents to attend meals, free exercise classes, play cards and other games, obtain free income tax service, free hearing screening, utilize the Community-Based In-Home Services and receive Meals-on-Wheels. The Senior Center also provides transportation to and from doctor appointments, for grocery shopping and various other errands for $1.00 each way. Once a month, the Senior Center provides transportation to Scottsbluff, Nebraska.